The 1st of December, notifications of acceptance and rejection were submitted to the authors. 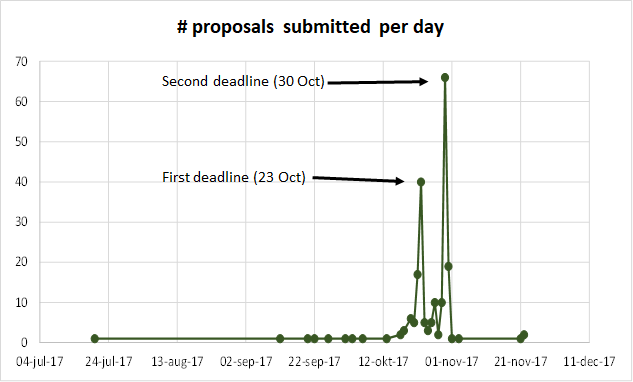 Before this was made possible, a trajectory of opening a call for proposals, waiting for the submissions, closing the call, divide the proposals among reviewers, waiting for the reviews and, finally, based on the reviews, per proposal reach a decision about acceptance or rejection has been walked. After opening of the call in July, the 1st submission already came in on 20 July. We had set the deadline for submission on 23 October. On that day we had received 82 proposals, where we (based on previous OEGlobals) aimed at 120 proposals. We therefore decided to extend the deadline with one week to 30 October. The next graph shows you what happened in that week. On 30 October, 66 submissions came in, with an additional 19 on 31 October. The pool of reviewers however was calculated on 120-130 submissions instead of the 202 we had received. This would mean that each reviewer had to review 13-14 proposals instead of the 6-8 I had asked them for. It was heartwarming to experience that the majority of reviewers did not bother the extra workload when I asked them. Even more heartwarming was that an extra 12 reviewers offered themselves voluntarily within 24 hours, after 1 tweet and some retweets! This showed me the value of a warm and strong open community. With some late submissions we ended up with 207 proposals. After the reviews were submitted, the conference team discussed about the reviews, especially those proposals where the reviewers did not agree or where one or both reviewers had hesitations on acceptance or rejection. 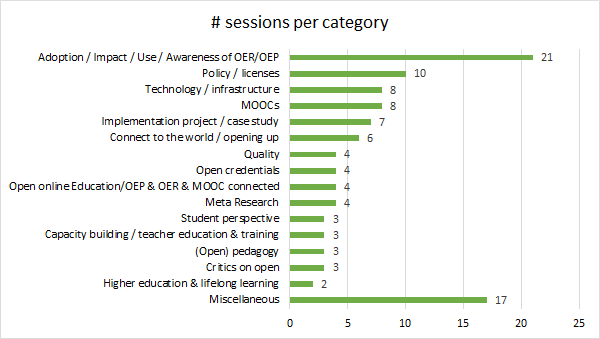 We kept in mind that the OEGlobal should reflect the Open Education Consortium: a global consortium with both experienced members and newcomers in the arena of open education, represented by policy makers, management and support staff, teachers, students, and researchers. So there should be a place for both proposals based on scientific research as for proposals about policy or practices, not per se based on scientific research. In the end 151 proposals are accepted (73%) and 34 are rejected (16%). 22 proposals are accepted under conditions. They are asked to rework their proposal taking into account remarks by the reviewers. Depending on their reworked proposals, we can decide about their acceptance or rejection. 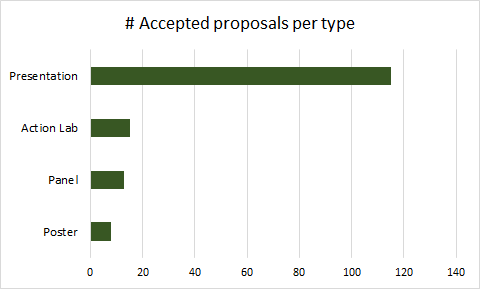 Here are some statistics about the 151 accepted proposals. 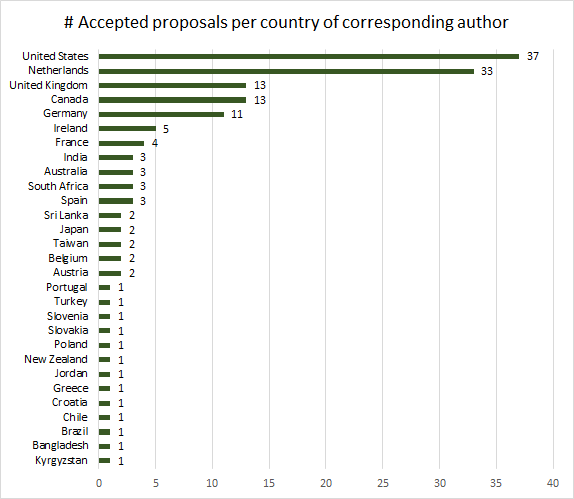 First, the number of proposals per country of the corresponding author. To get a better picture about globalness, the same information is displayed in a worldmap. The green areas represent the origin of accepted proposals. 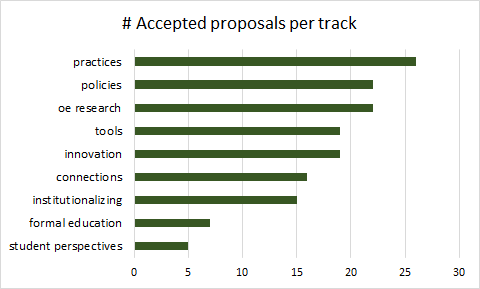 This picture reflects the large diversity of proposals received. What these statistics do not reflect is the high quality of many of the proposals. I am looking forward to a vibrant and interesting conference in April next year. In 2018, the yearly Global Meeting of the Open Education Consortium will be from 24-26 April in Delft, organized by Delft University of Technology. Behind the scenes, many people are already busy with the myriad of issues that comes with organizing such an event. Papers will be made available in Conference proceedings. For those interested, there is an opportunity to publish a paper in a Special Issue of Open Praxis. Both publications will be made available full Open Access (under a CC-BY license) and publishing in Open Praxis does not require an author fee. Due date for sending in proposals is 23 October 2017. We hope to receive many interesting proposals that will contribute to a wonderful event in 2018! Last week I was present at the yearly Global Meeting of the Open Education Consortium. The event took place in CapeTown, to celebrate the 10th anniversary of the Cape Town Declaration on Open Education. The category “Miscellaneous” consists of sessions with a subject that was presented only once (e.g. business models). The categories are not disjunct, so for some presentations I had to judge what category was the best fit. But overall it can be seen that focus is more and more on adoption by (in Rogers’ terms) the early and late majority of teachers. Some presentations in this category also mention access for individual students (self-learners). The overview of the program provides access to the information of each presentation and the slides that were used. At the time of writing of this post not all slides were made available yet. I expect they will be in the next coming days. Moonshot projects to support Dutch national policy on OER (together with Martijn Ouwehand from TU Delft). About the two flagship projects (that was the right term to use), initiated by the Dutch Ministry of Education to serve as good examples for cross-institutional creating and sharing of OER. The ROER4D project is nearing its end and the results are increasingly becoming available. The presentation of Cheryl Hodgkinson-Williams (Principal Investigator of ROER4D) titled The adoption and impact of OEP and OER in the Global South: Theoretical, conceptual and methodological framework for the ROER4D project meta-analysis provided an impressive overview of what was accomplished in the 18 case studies that were conducted in ROER4D. Glenda Cox and Henry Trotter presented Understanding lecturer’s adoption of OER: a multi-factorial approach. They have put me on the track of an alternative way to approach the question of broad adoption of OER, where Rogers’ Innovation theory was not sufficient. Unfortunately, I missed the presentation of Catherine Cronin (Openness and praxis: Exploring the use of open educational practices for teaching in higher education) about a similar research on adoption, but a paper of her in IRRODL about her research findings is in press (preprint). Although all three research projects started from a different perspective, the findings were more or less similar and comparable with our research in the Netherlands. It may be worthwhile to expand on this in the coming period to see how the different perspectives can be joined into one framework to approach the question of how to increase adoption of OER among the early majority of teachers. We had an inspiring discussion with Henry Trotter on this as a start. It was also good to see that more and more the narrow view on open learning materials is expanded to a broader view on openness, including open infrastructures (with Norway and the Netherlands as two fine examples) and open pedagogy. 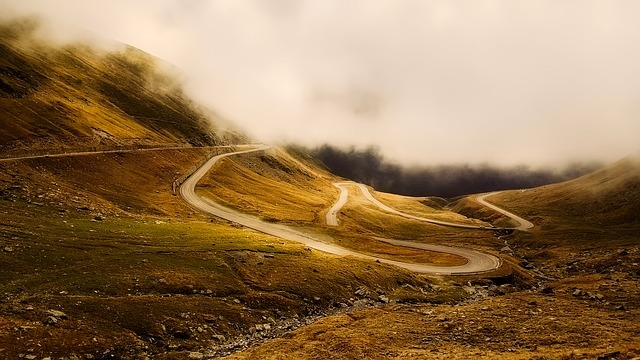 My opinion “We should be more open about open”, quoted by Tom Caswell already in 2012, is necessary to connect to the early and late majority. The presentations from Rajiv Jhangiani (Pragmatism vs. Idealism and the Identity Crisis of OER Advocacy) and Jamison Miller (The Constraints of Policy: A Critical Discourse Analysis of Open Education Policy in Virginia) hit the nail on the head. Indications to be more open on open came also from my research project on adoption as was mentioned earlier, and I intend to go deeper into this the next period to find out in more detail how such a connection can be made fruitful. The toolkit Martijn Ouwehand and myself have developed, may support one of the approaches (connect to the core of the teacher). And finally, the presence and achievements of members of GO-GN was wonderful to experience. Too bad, a virus catched some of them (we call this now the OERHub-virus), so they could only be partially present at the conference. GO-GN has developed into a vibrant community, both online and offline, which was intended at the start of this. Next year the Global Meeting will take place in beautiful Delft, 24-26 April 2018. I am honoured to be appointed the Program Chair of that Meeting. 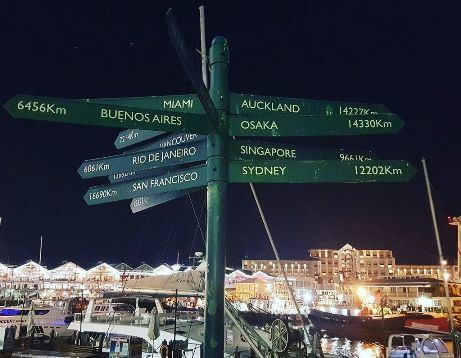 Glenda Cox, the Program Chair in Cape Town, has set the bar high with an excellent accomplishment!